Korean BBQ Tacos with Jackfruit! It’s no secret I’m a BIG fan of Jackfruit. It’s my favorite ingredient to use as a veg alternative to meat. When gluten and I had to part ways, I was in a tizzy trying to find replacements for the meat substitutes I had used in the past. Most were full of gluten. And then I discovered eating copious amounts of soy didn’t jive with me. (I’m only speaking for me. You decide what works best for you, ok?) I needed to balance the amount of tofu and tempeh I was eating nearly every day. Jackfruit to the rescue! 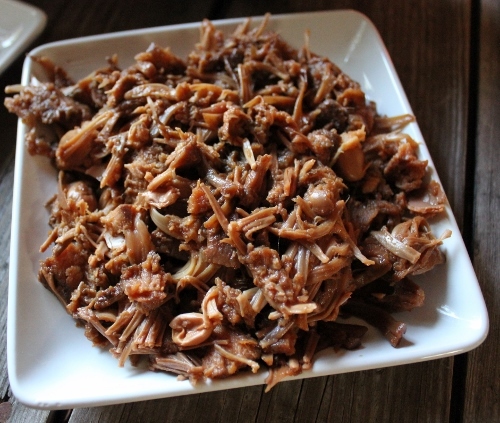 This recipe, like the many others on my site, uses canned young green jackfruit. That is to say, it is not the ripe, sweet jackfruit that works great in desserts and smells like Juicy Fruit gum. Young green jackfruit has little to no flavor and takes very well to the seasonings it is cooked in. It also shreds like pulled pork. You can find it in most Asian markets frozen or canned. I prefer the canned in water as opposed to brine. I used very thinly sliced jicama to make the taco shells. You could use jicama, lettuce wraps or a traditional taco shell. 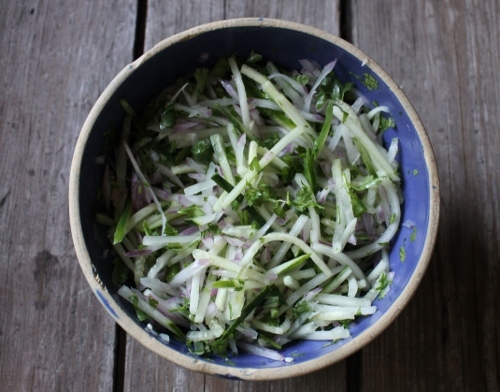 In addition to the jicama shells and the slaw recipe below, I use shredded red cabbage on these tacos. So good! Combine all ingredients in a small crockpot. Cook on low for 4-6 hours. Jackfruit will easily shred with a fork. 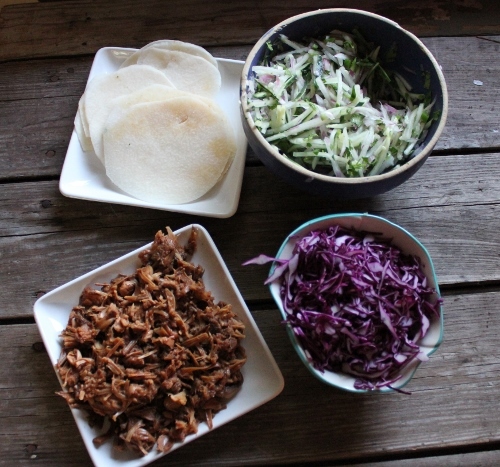 Serve hot with taco shells, korean bbq taco slaw and shredded red cabbage. LOL Okay, I get it now .. you have two recipes in one post. Duh. I need one of those breakfast cookies to wake me up!! Johnna, this was good! I used frozen jackfruit and only 1 teaspoon of sriracha and it was still a bit too spicey for DH and son, but fine for me! Of course, it needed a dollop of kimchi on it, too! Making it again, I also will likely not even cook it, I tried some ‘raw’ and it was fine. I think marinating all day or overnight in the fridge will help it soften up plenty. As it was, I only cooked it for about 30mins and that was fine. Thank you! Oh, I’m so glad you enjoyed it, Cyndi! I would love to hear how it turns out for you when your marinate it. I had never even considered that, but it seems like a great possibility.